If you live in the United States then you will probably be celebrating Thanksgiving tomorrow. And like many families, chances are you will have a turkey on the table. 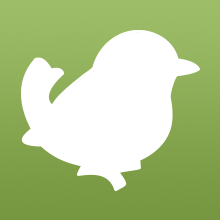 But what do you really know about these birds? Did you know that Wild Turkeys sleep in trees, can fly up to 55 miles per hour, and that theyâ€™re highly intelligent and social animals? Here are some cool facts about one of the most famous birds in North America. 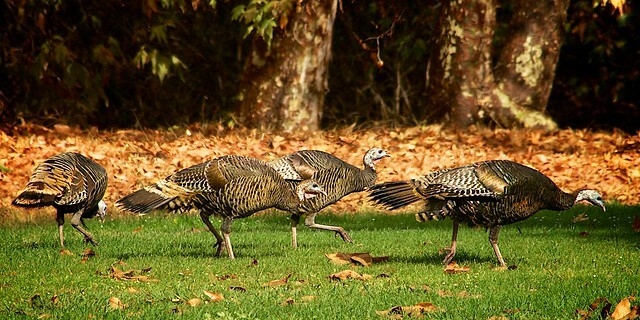 Many people think that, because they are so heavy, turkeys are slow and that they stick to the ground. But in fact Wild Turkeys have powerful legs and can run at speeds of up to 25 miles per hour and fly as fast as 55 miles per hour. 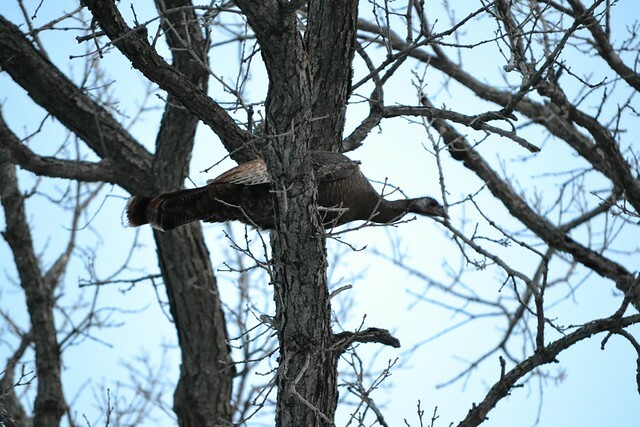 Wild Turkeys sleep in trees. Even domesticated birds try to sleep in trees when they get the chance. This keeps them safe from predators, such as coyotes, foxes and raccoons, as not only people have a taste for turkey. Male turkeys are substantially larger than females. They look different too: the maleâ€™s feathers are iridescent red, green, copper, bronze, purple and gold, while the female is much duller overall and mostly brown and grey. This difference is called sexual dimorphism. A turkeyâ€™s gender can be determined by its droppings! Males produce spiral-shaped poop, while females produce â€œJâ€ shaped poop. Also, the diameter of the droppings increase as the turkey gets older. A popular story is that Benjamin Franklin wanted to make the turkey our national bird, instead of the Bald Eagle, but this is actually not quite true -- at least not officially. Back in 1784, Franklin wrote a letter to his daughter disapproving of a drawing that had been produced of an eagle that looked liked a turkey and that such a bird would actually be preferable to the eagle as national symbol. As Franklin explained, the Bald Eagle had a â€œbad moral characterâ€ and was a â€œrank cowardâ€ that merely steals its food from other birds. So while it is true that he floated the idea that the turkey might be a better bird for a national symbol, it was only in this personal letter and in relation to the drawing. He never actually advocated this notion publicly. Did you know that male turkeys have â€œbeardsâ€? Male turkeys are called gobblers and the hairlike bristles that grow from the center of their chest get about 9 inches in length. In some populations 10 to 20% of females have a beard too, although itâ€™s usually shorter and thinner than that of the male. The color of the Turkeyâ€™s head and throat changes depending on its mood. It can change from gray to shades of red, white and blue when the bird is excited or distressed. During mating season, the maleâ€™s wattle turns a scarlet red. The fleshy object over the maleâ€™s beak is called a â€˜snoodâ€™. A turkey has 5000 to 6000 feathers. 18 of those are tail feathers that make up the maleâ€™s distinct fan. 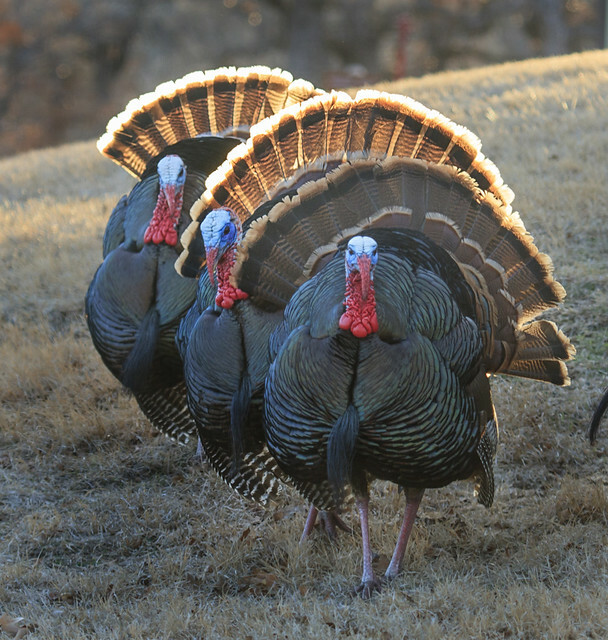 Each turkey has a unique voice, allowing birds in a group to recognize each other. Turkeys create lasting social bonds and are very affectionate. The turkeyâ€™s gobble can be heard a mile away. Only males gobble. The females, or hens, communicate through clucks and small chirp-like noises. Turkeys have very good geographic skills and are able to learn the precise details of an area over 1,000 acres in size. Looking for something to do this Thanksgiving while the rest of the family is preparing dinner or watching a football game? Then grab your crayons and start coloring because we have a great coloring page for you with our cute cartoon Wild Turkey! Show your love for Wild Turkeys with this coloring page from Birdorable and have a wonderful day tomorrow with your friends and family. 3 comments on "Cool facts about the Wild Turkey"